For the first time ever, Genos International EU is proud to announce an upcoming LIVE ONLINE Emotional Intelligence Certification Programme. 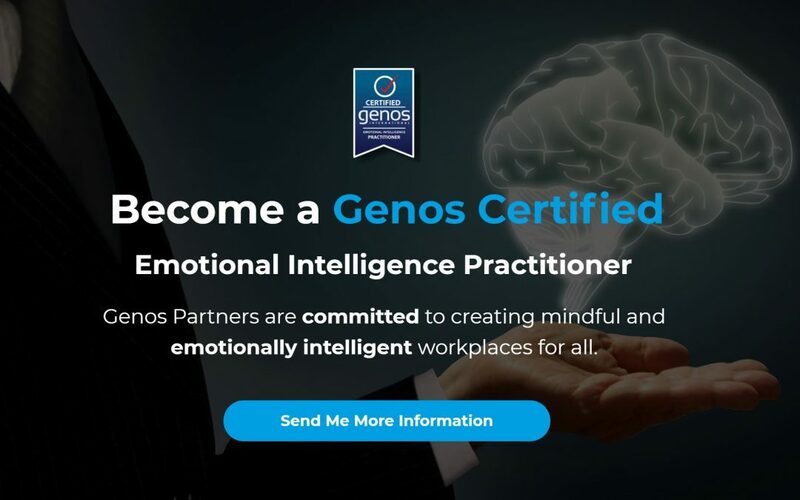 If you’re a coach, consultant, trainer, learning & O/D professional, human resource consultant, or an organisational psychologist, the Genos Emotional Intelligence Practitioner Program will dramatically enhance your credentials and credibility by making you an expert in applying Emotional Intelligence (EI) in the workplace. Genos Partners are committed to creating mindful and emotionally intelligent workplaces for all. 6 weeks, 90 minute sessions, online and interactive. Recordings provided should you miss a class. Kick-start your Genos business with our 12-week ‘fast-start’ program. Gain access to a package of world-class materials to support your Genos business post-program. What’s does the Full Program Include? A place on the Live Online Genos Certified Practitioner Program. Receive a full Certification binder in the mail with all the materials you’ll use in the program. Six 90 minuteinteractive sessions where you’ll learn how to effectively deliver powerful EI solutions. Access to the full suite of products and 4 compelling Add-On 1 day programs – all complete with scripts, workbooks, and guidance for delivery. No additional cost. Lifetime membership to Genos University. Free seat on the Mindful Leader Train the Train Program so you can deliver the popular Mindful Leader to your own network. At no additional cost, you’ll receive a seat on the Mindful Leader Train the Trainer so you can deliver this popular and powerful program to your own clients and/or organisation. If you’re an independent coach, consultant or trainer: develop ‘residual revenue’ not dependant upon man-days.